C&M Scientific Ltd understands the need for accurate controls on instrumentation. Validation is an extremely diverse and complex area of regulatory concern, impacting all areas of pharmaceuticals, medical devices, manufacturing, biological research and clinical testing. Validation has become one of the most important areas of regulatory compliance for the laboratory. Particularly in the pharmaceutical industry where international regulatory agencies, led by the United States Food and Drug Administration, (FDA) now require laboratories to show validation for both methods and analytical equipment. Within the validation programme lies the whole area of qualification testing which is carried out at predefined intervals and sets out to show that equipment has been installed and operates or performs to the manufacturer’s requirements and is suitable for its intended use. The following somewhat simplistic schematic of the qualification programme shows the relationship between the stages of qualification testing and validated use. Regulatory bodies expect to find a DQ where the supply is bespoke. Regulatory bodies expect to find a DQ where the supply is bespoke. Constructing a useful and meaningful DQ can be highly productive when taking on large multifaceted systems, particularly where customisation or bespoke software is included. The starting block for many Validation Projects. The starting block for many Validation Projects. This is often as far as some companies get. A good IQ can cover many aspects of the validation process. C&M Scientific can offer advice on the scope of such documentation. We have a small library of protocols available as examples. Most companies should achieve this level of validation. Most companies should achieve this level of validation. C&M Scientific have a considerable experience in executing OQ. From the simple temperature control to complex analytical equipment, establishing and executing high quality OQ is a strong element of C&M Scientifics capability. Perhaps the most meaningful element of validation. Perhaps the most meaningful element of validation. Testing the equipment in a dynamic state with the plan use of load configurations provides the most valued data in supporting a regulated process. In conjunction with the client C&M Scientific can construct high quality documentation and the execution of PQ. C&M Scientific Ltd can provide qualification protocols for all instruments to IQ and OQ level. For selected instruments (commonly multi-component systems) C&M Scientific Ltd can provide Performance Qualification protocols. Our team of validation support personnel can also assist in the preparation of PQ protocols. Get in touch to enquire about how we can aid you in the validation of your laboratory processes and its equipment. Laboratory controls shall include the establishment of scientifically sound and appropriate test procedures designed to assure that drug products conform to appropriate standards of: identity, strength, quality and purity. An extract from the FDA Compliance Program Guidance Manual says that: Laboratory equipment and procedures must be qualified and validated. 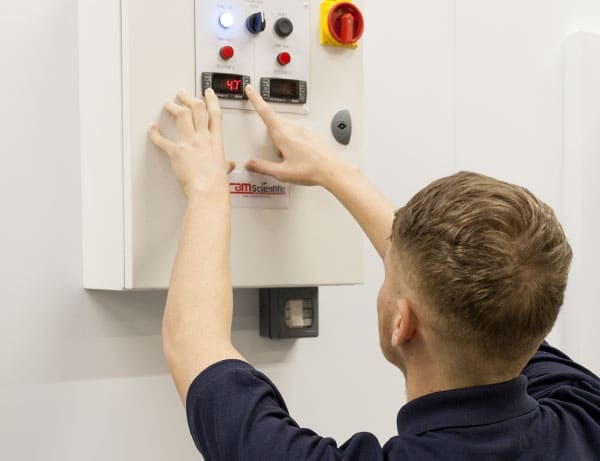 Within the validation programme lies the whole area of qualification testing which is carried out at predefined intervals and sets out to show that the equipment has been installed and operates or performs to the manufacturer’s requirements or specifications and is suitable for its intended use. The following somewhat simplistic schematic of the qualification programme shows the relationship between the stages of qualification testing and validated use. The first stage of the qualification testing is known as pre-purchase qualification, which is the user’s formal functional qualification. Commonly called a User Requirement Specification (URS), this document lays down the requirements for intended use including application and environmental requirements. Get in touch with us to discuss how we can help your laboratory operations. Our trained engineers are only a call or an email away. We welcome your enquiry and enjoy answering your questions.